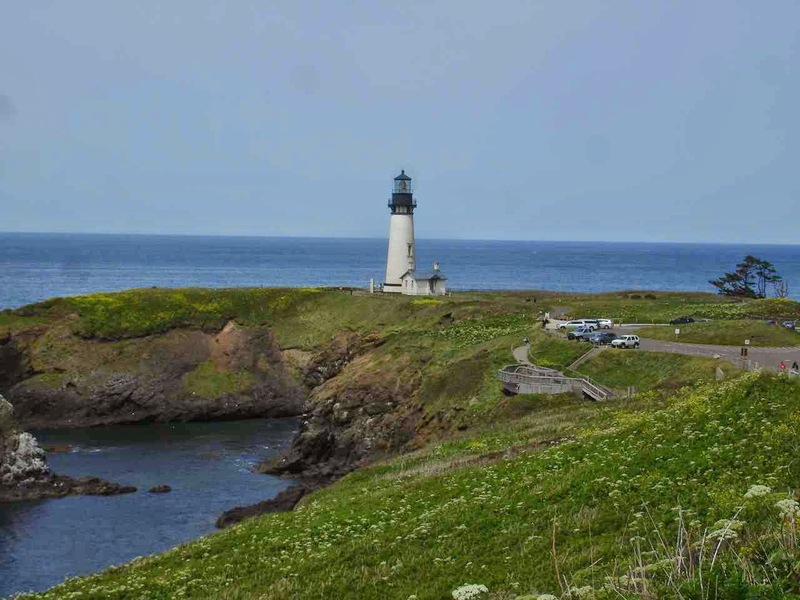 Starting from Newport, Oregon, this is Yaquina Head Lighthouse just across from South Beach State Park(see last posting). This is a well kept lighthouse, including a visitors center and a docent for tours. All of this is free on your America the Beautiful pass. Back in the late 1800's, this was maintained and kept very similar to New England lighthouses. There were additional buildings , homes and animal pens, as well as gardens. The lighthouse is one mile into the ocean. Now accessible by road, back then it was trails and beach and boat. 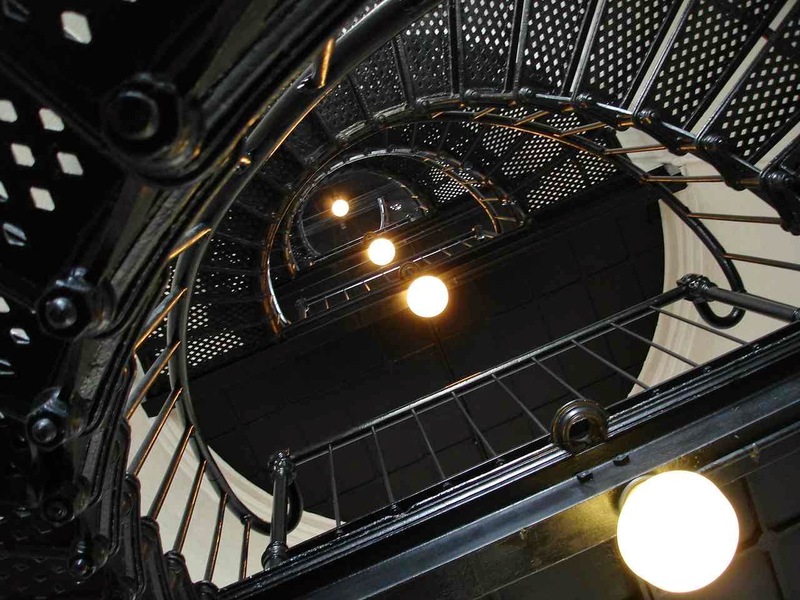 There is something I can't resist about pictures looking up a spiral staircase. This lighthouse is maintained by the Bureau of Land Management (BLM) . They had some interesting maps and information at the visitors center on BLM lands, including the national forests. 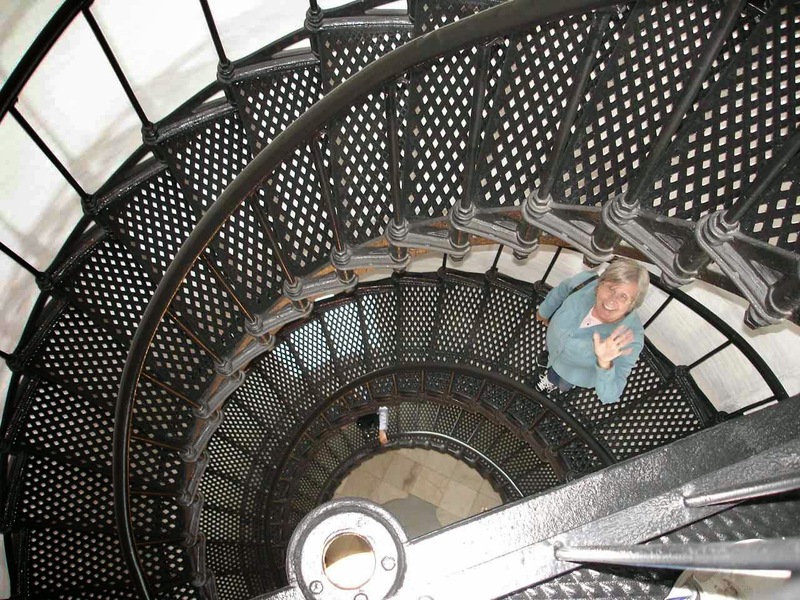 At the top of the stairs was the huge Fresnel lens. Using those things you learned in Junior High Science classes ,like light refraction, the light is focused into one powerful , thin beam. The lighthouse is still active, though it is now fully automated and does not require the continuous filling of oil for burning. The following website offers more info. 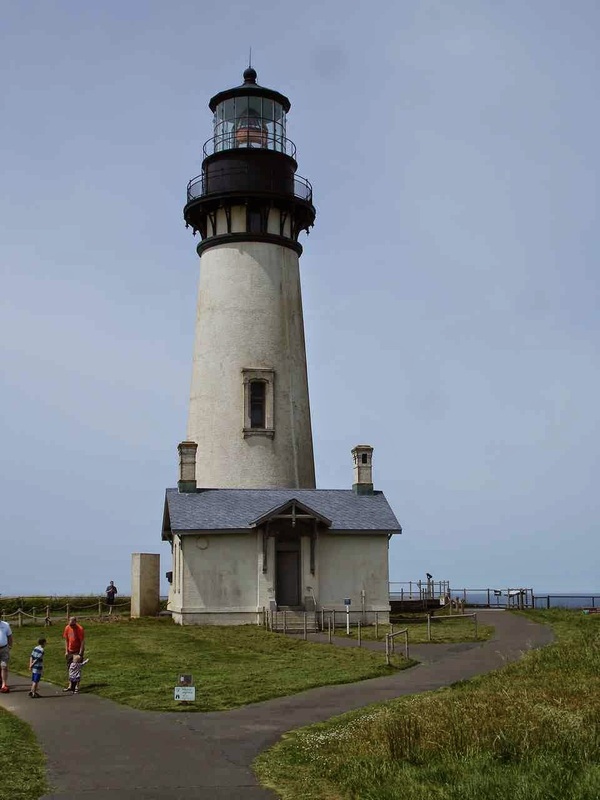 The website comes up on the original Yaquina Bay Lighthouse. 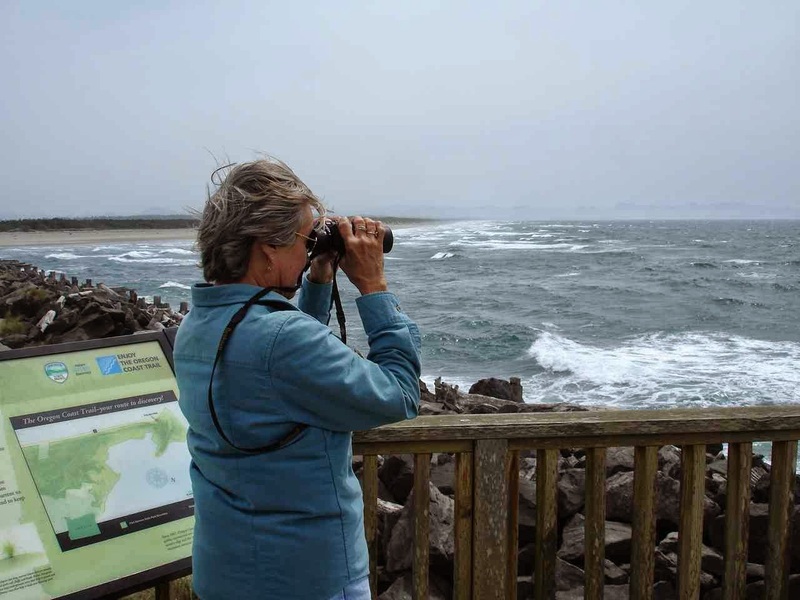 You want to look at Yaquina Head Lighthouse. 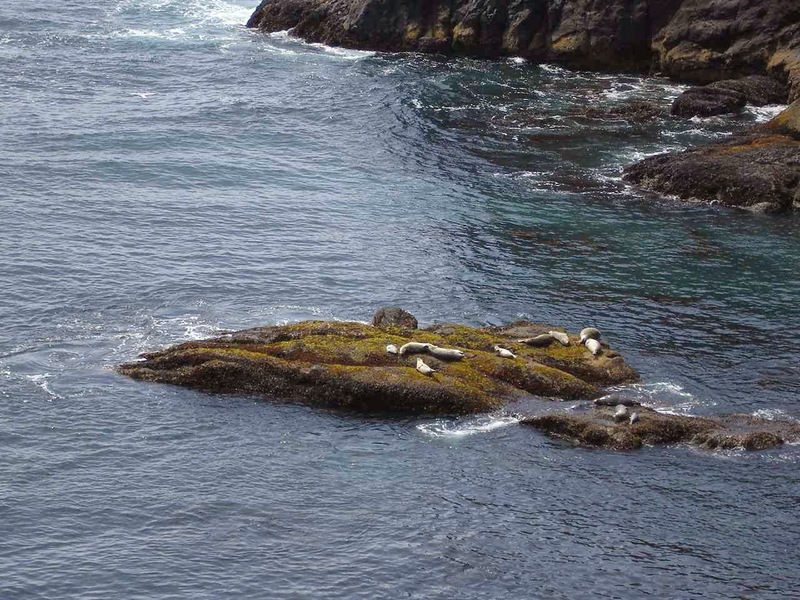 On the rocks below the lighthouse are many Harbor Seals. Other rocks are home to thousands of shore birds. Route 101 is a scenic road for most of its travel right along the Oregon coast. Some 363 miles of beautiful coast. There are small , quaint fishing villages as well as the occasional vegetable stand. This stand had wonderful artichokes-not in season--, some very tasty and tender asparagus, and great lemon blueberry scones from their own bakery. 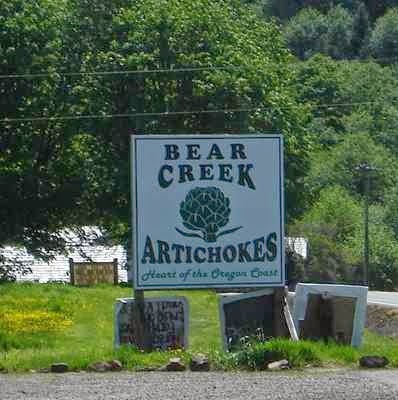 Also along the way are larger towns, such as Tillamook. 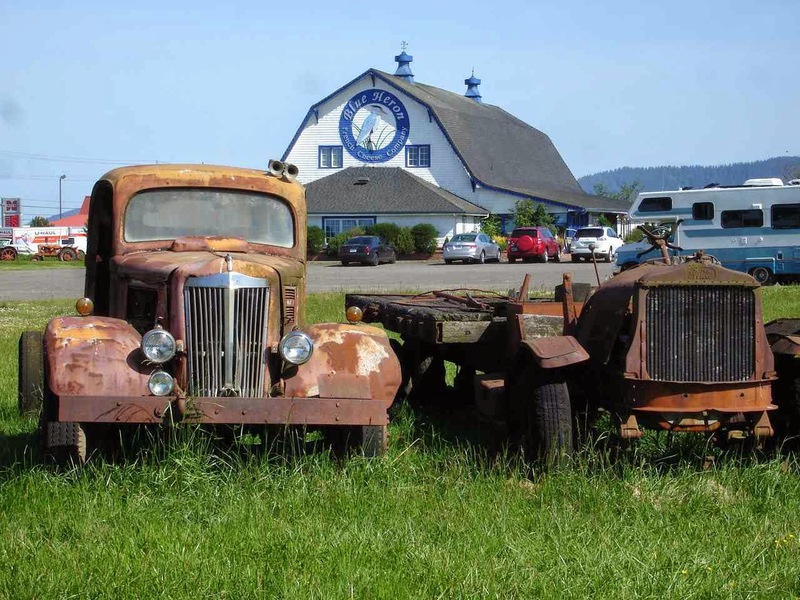 This is from the Tillamook Air Museum which is right along Route 101. 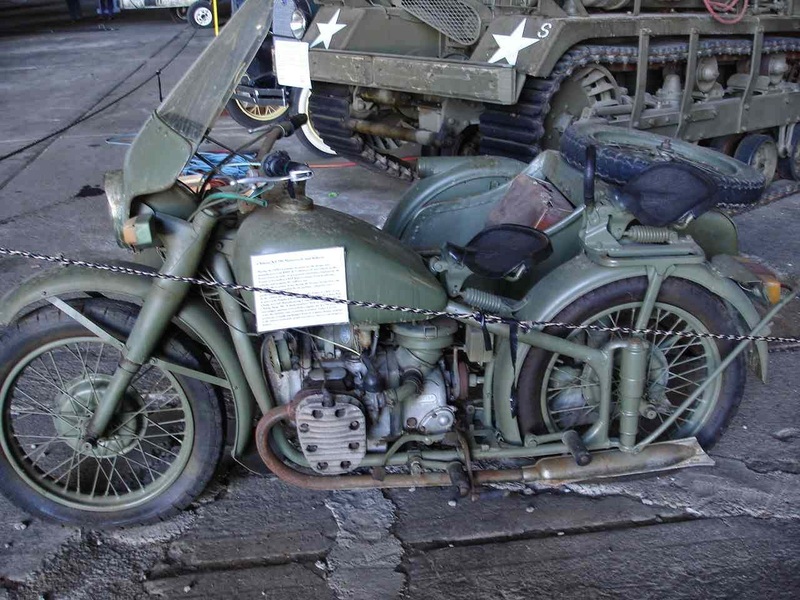 This is a WWII BMW motorcycle with sidecar. 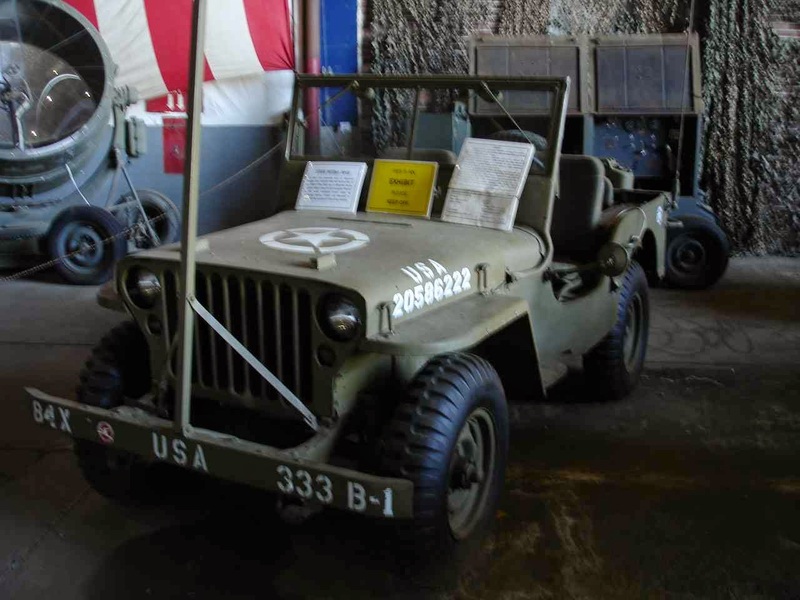 To the right is an original 1944 Willys Jeep. The tall post attached to the front bumper was to snag and cut wires that would be strung across the back roads intending to decapitate unwary chasers. The famous F-14 Tomcat jet, retired from service in 2006. 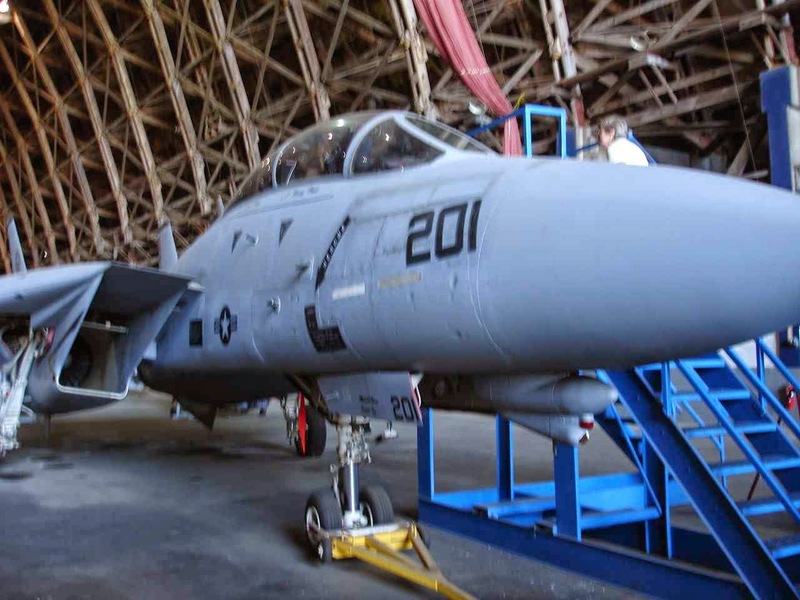 Some might remember Tom Cruise in Top Gun, who flew an F-14A Tomcat off the USS Enterprise. We could have stayed for free as Harvest Hosts members at the Air Museum. But, we went across town to Blue Heron French Cheese Company. This is also a member of Harvest Hosts and Lady Blue was quite happy to have plenty of room around the antique trucks and chickens. I had to look closer at this antique. It came all the way from Buffalo, New York. At 13 horsepower, it was run by steam power. The operator could feed wood into the back, steam would be released from the stack, and a horizontal piston would drive the rear wheels. We had to add this picture for Cliff and Vicki. 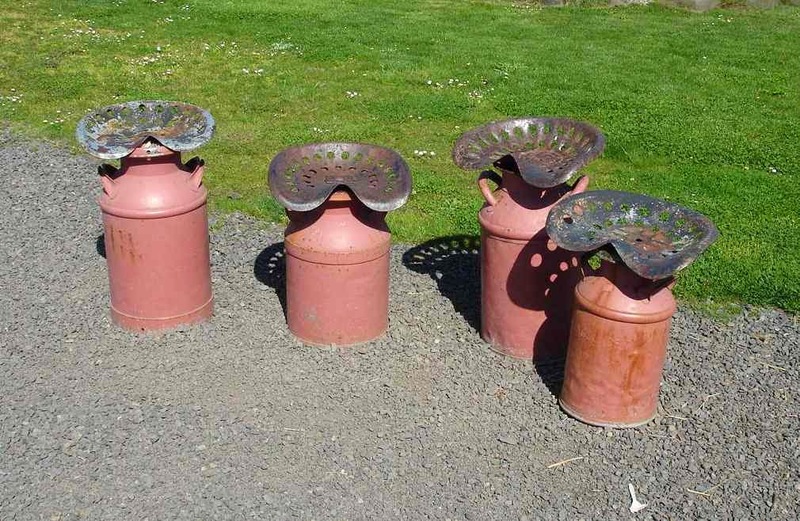 The old milk cans topped with old tractor seats seems like a great antique addition to the yard. 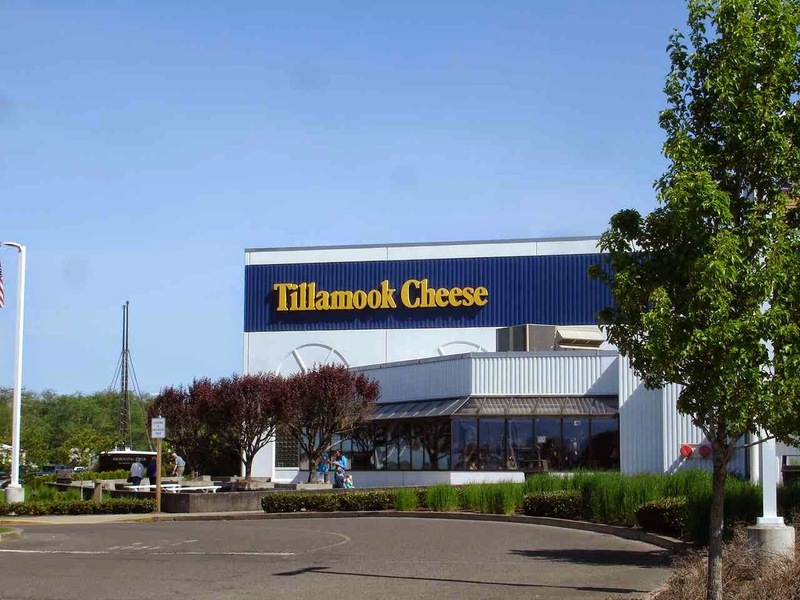 Anyone from the west coast knows the company Tillamook Cheese. We saw their butter and cheese from California north, but also in some stores further east. I love the story of the farmers in the 1800's realizing that the land was too wet for regular crops. Turning to dairy farming, they also found out that milk did not travel well over the ocean and long land routes. So, cheese became their trademark. 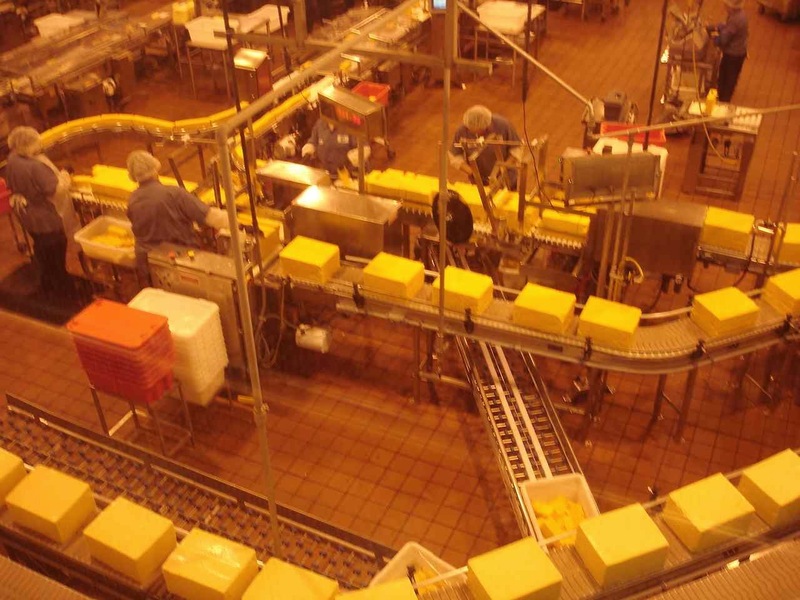 They also realized quickly that the hundreds of local farmers would do much better to form a cooperative to make and sell their own cheese across the country. 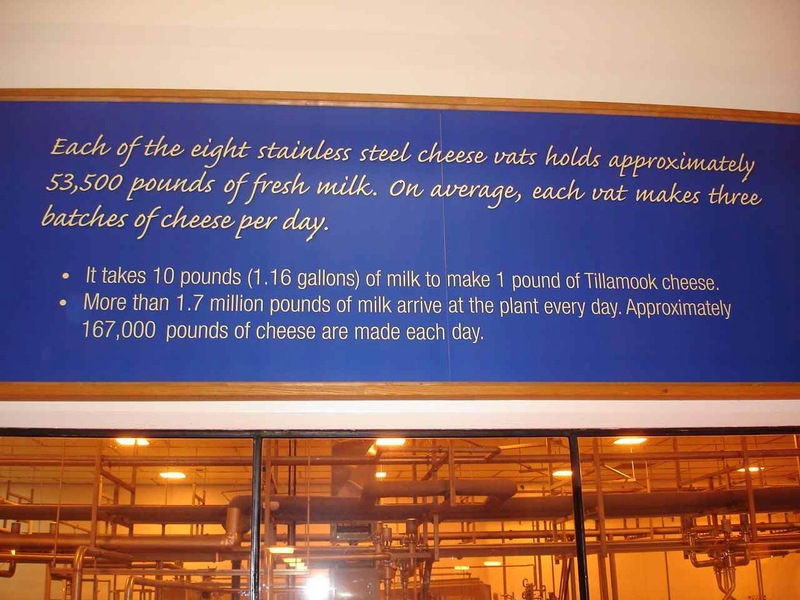 Thus, the Tillamook County Creamery Assc. There is a nice factory tour inside. Even parking outside, you see a number of milk tanker trucks arriving with fresh milk. Inside you can watch a number of videos showing families running very clean, modern dairy farms. I was surprised to read that milking was done twice a day, one of which times was 2:00am. Bur with hundreds of cows on each farm , the milking process takes 4 hours each time. Note the figures to the left. 1.7 million pounds of milk every day. Also, 10 pounds of milk to make each pound of cheese. As a side note, Jan and I found the Tillamook Old Fashioned Vanilla Ice Cream to be among the best ever. Still much to see along the coast. 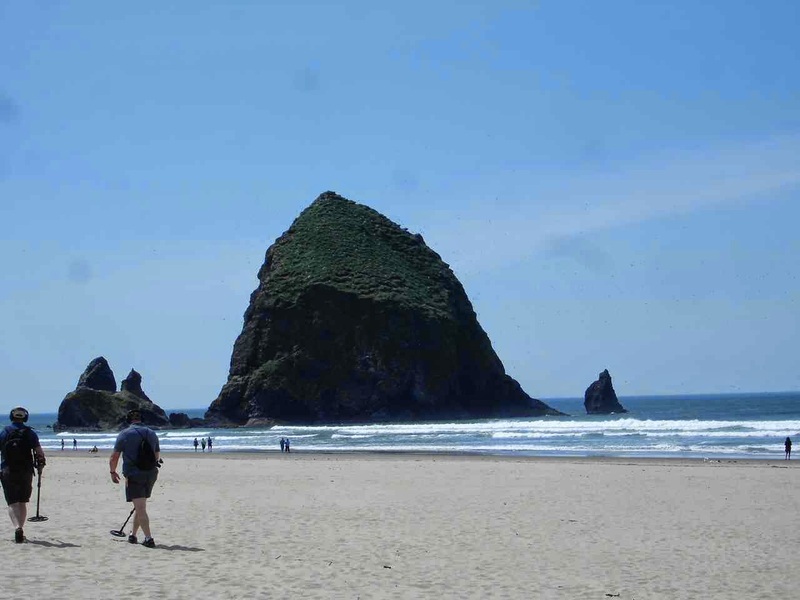 Along Cannon Beach, you can look for the Haystack(right) and Needles(yes, the smaller rocks). Miles and miles of accessible beach to walk or just sit and enjoy. Also. on the way, is Seaside. Seaside has a long, flat beach that is great for swimming and surfing. There is a boardwalk(now made of cement) that goes for about 2miles right along the beachfront. 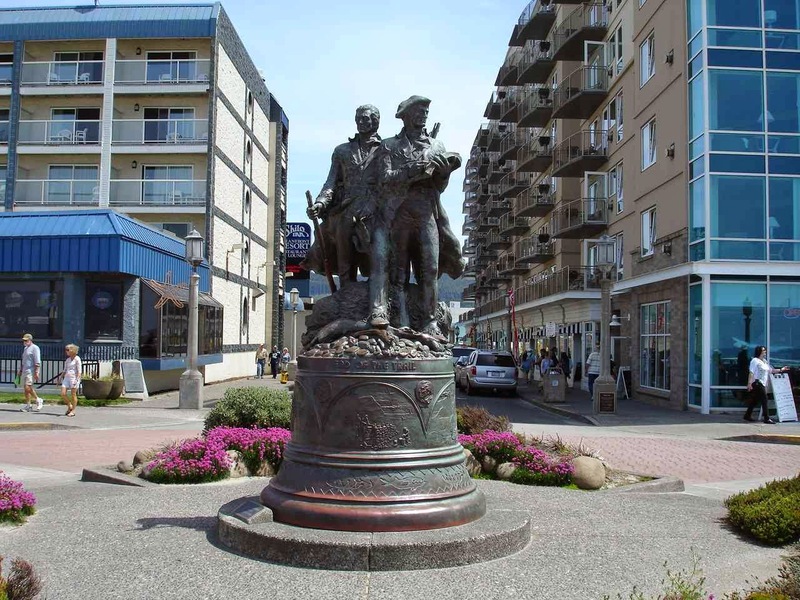 This statue is of Lewis and Clark. 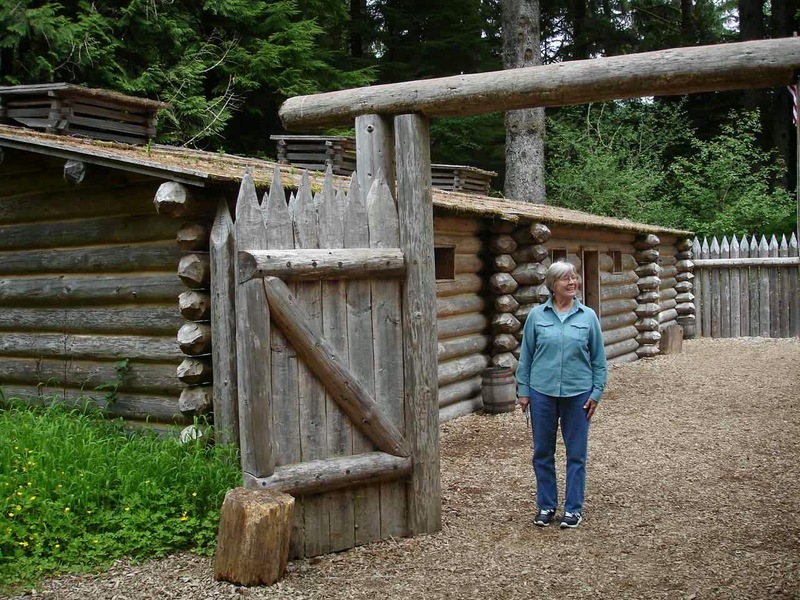 We are very close to their 1805 winter quarters on the Columbia River. This spot was used to boil down ocean water for salt needed for the return home of the Corps of Discovery. Jan and I enjoyed great steamed clams at the restaurant in the background on the left. Which brings us to Fort Stevens State Park at the mouth of the Columbia River. This is the largest state park west of the Mississippi River. Many sites and quite full for the entire weekend. 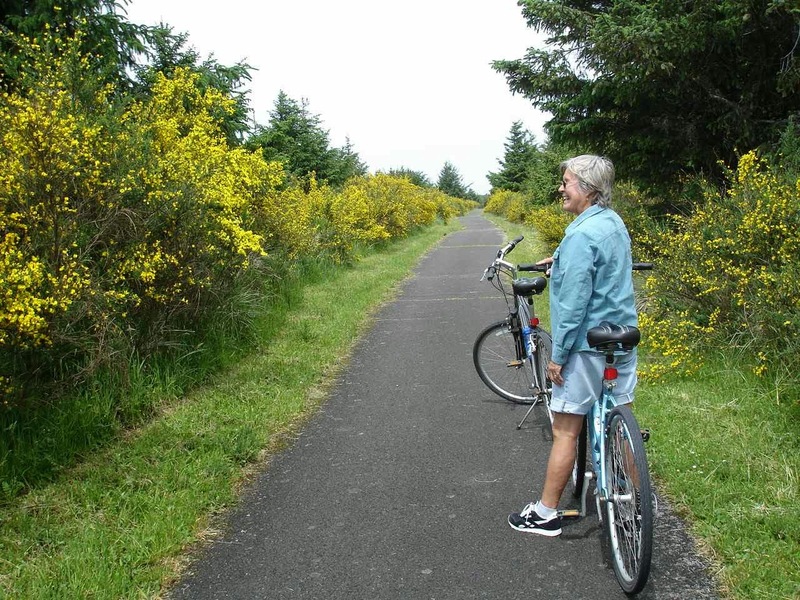 The park has miles and miles of trails for walking, biking, or horseback riding. By the way, this is that blossoming bush that we mentioned back a few issues. It is Scottish Broom and evidently is an invasive species. Down the coast, they were organizing groups to tear out any bushes they could see during the blossom season. Oh well. It looks great here. The bike trail(10 plus miles)brought us to the South Jetty. At this point we are looking at the Pacific Ocean. To the right the jetty goes out into the ocean and further to the right is the mouth of the Columbia River. You can certainly understand why this area could be so dangerous for ships. Further along the bicycle trail is the Columbia River. You can stand or sit here and watch all kinds of boats go by. 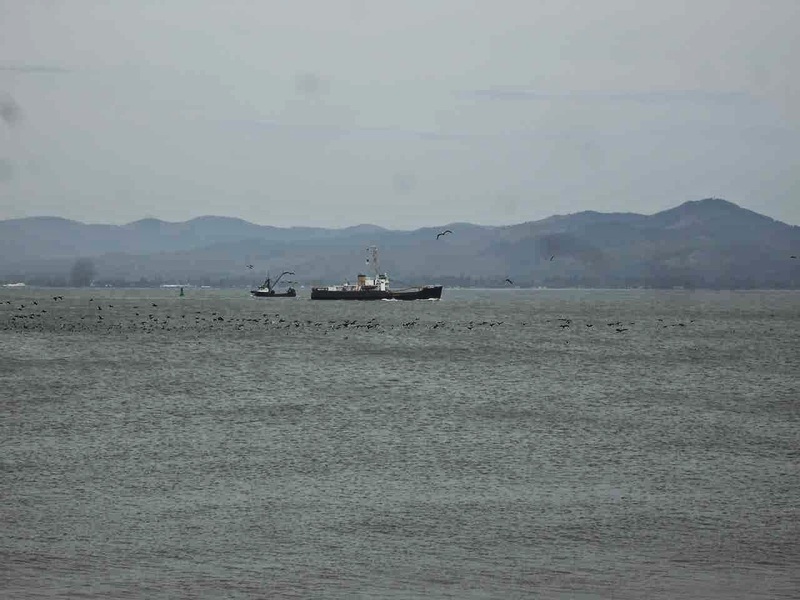 Small and large fishing boats like these, or large shipping containers and cruise ships. We are looking across the river to the Washington coast. The next day is another bike ride. 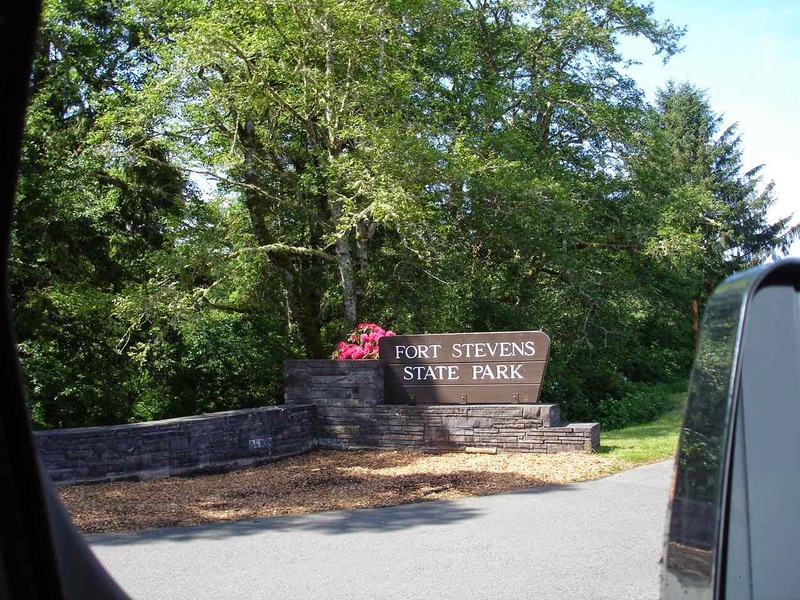 This time to the Fort Stevens museum. It took a while for the US Congress to realize that this area ,explored by Lewis and Clark in 1803 and ceded by Great Britain in 1846 , had no defense and could be seized by a small band or army. So Fort Stevens was built. 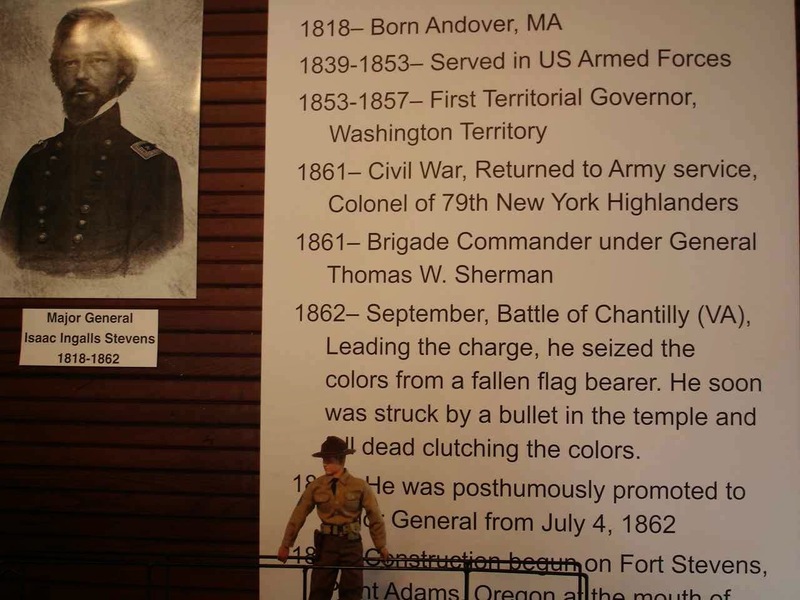 Jan and I were fascinated to know that Major General Stevens for whom the fort was named, was a native of Andover, Mass. To imagine travel and life in the early 1800's. A young military man travels to the west and eventually becomes the Territorial Governor of Washington Territory. 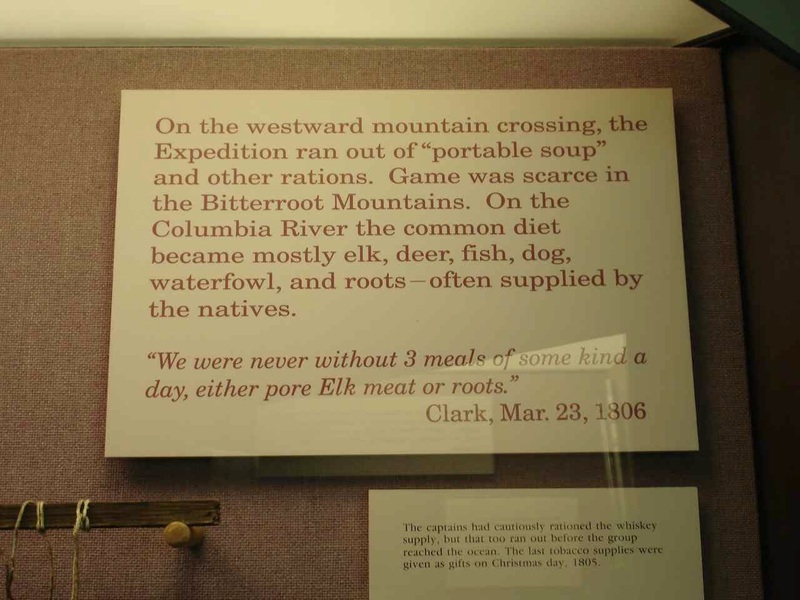 It inspires you to read more about travel along the Oregon Trail and the good stories of the Lewis and Clark expedition. The park museum concentrates on the WWII bunkers and setup for the fort. 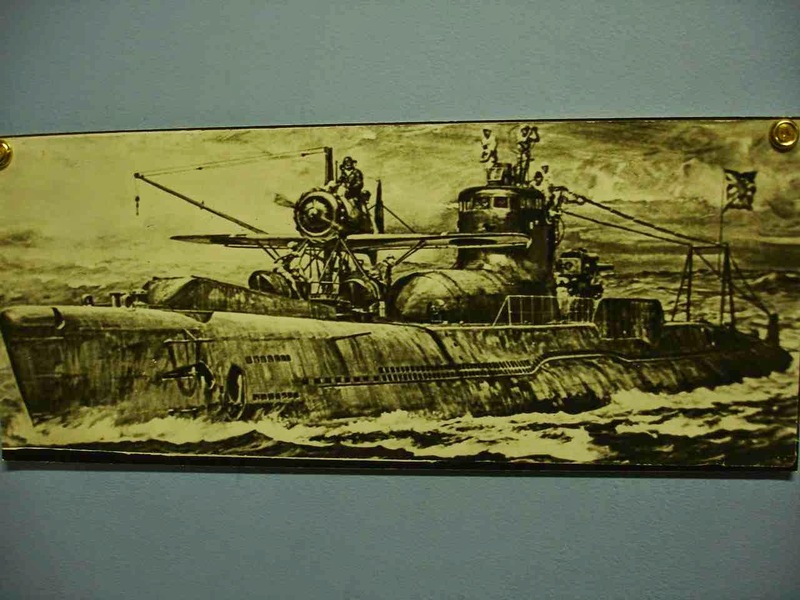 The picture to the right depicts the Japanese sub in 1942 that was responsible for the only missiles fired at a US military base since 1812. That plane has pontoons, but you know it was a hazardous launch to get off that sub in rolling seas. There was no damage from the sub firings. What was also interesting in the museum were the original newspapers from the war reporting on many things, including the large number of balloon bombs that were flown from Japan to the west coast. Many fell harmlessly, but some were picked up by unknowing families and children to disastrous consequences. Saturday was threatening rain, so we gave Lady Blue a workout to visit the Lewis And Clark National site. Fort Clatsup was their winter quarters for 1805. A few short months, but much needed to prepare for their return trip. The fort was named for the Indian tribe that was friendly to the group. 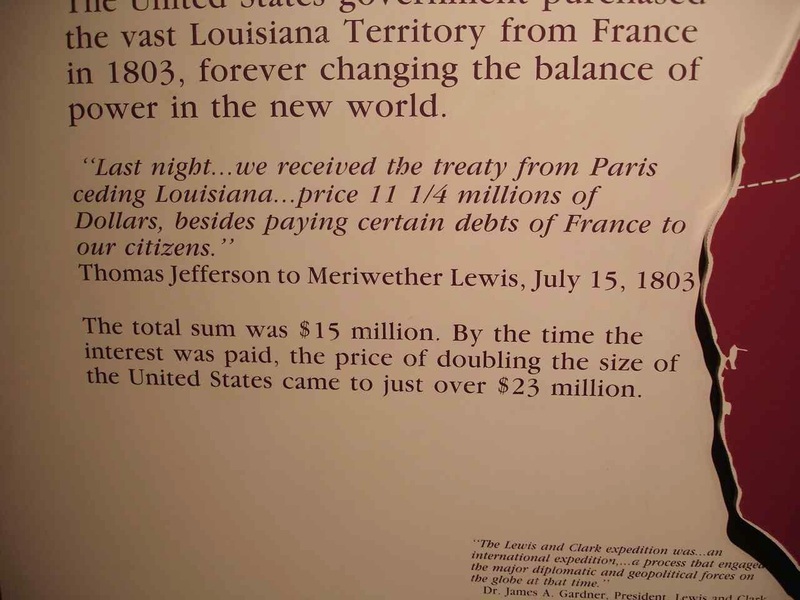 President Jefferson was hugely interested in expanding to the west and finding a river route to the Pacific. It was interesting to read about Lewis studying for mapping skills and journal skills to prepare for the trip. Of the 33 or so members of the Corps of Discovery, all made it safely back home except one who died of possible appendicitis early in the trip. Mostly they ate well, thanks to the hunters with the group and the friendly Indian tribes they encountered along the way. Not too sure about the "dog" on the menu. The Clatsup Indians were very good traders and well equipped for the coastal life. Their best loved tree was the Cedar. 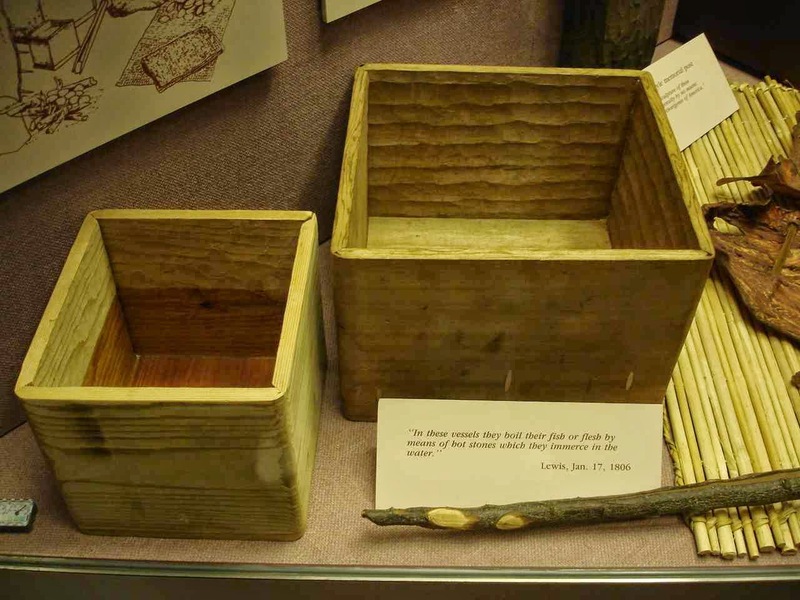 It was used for canoes, baskets, rope, mats, hats, building, and these boxes. The boxes would be filled with water to which hot stones would be added. Then they would use the hot water to cook. 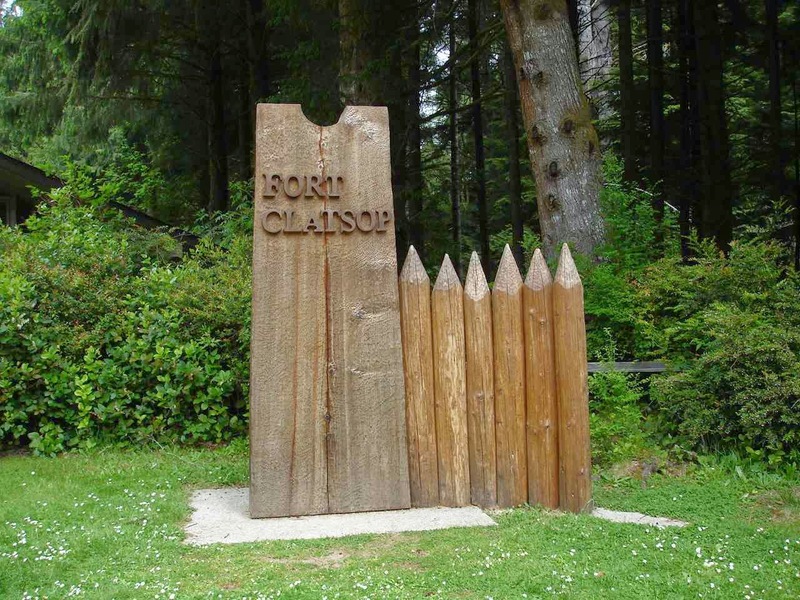 Using the original plans, a replica Fort Clatsup was built at the museum. A small , but very efficient military style fort. 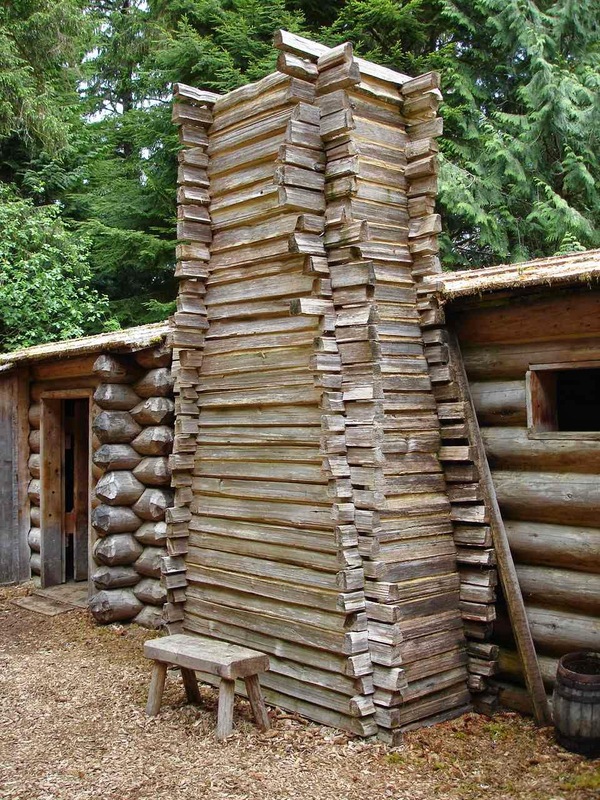 Yes, that is a fireplace chimney made of wood. 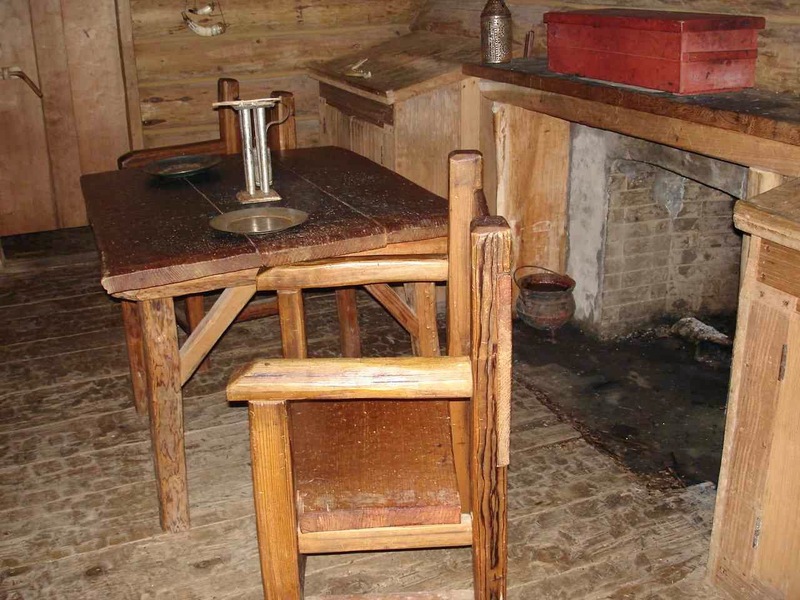 The inside fireplace for the enlisted men was quite unusual by our standards. 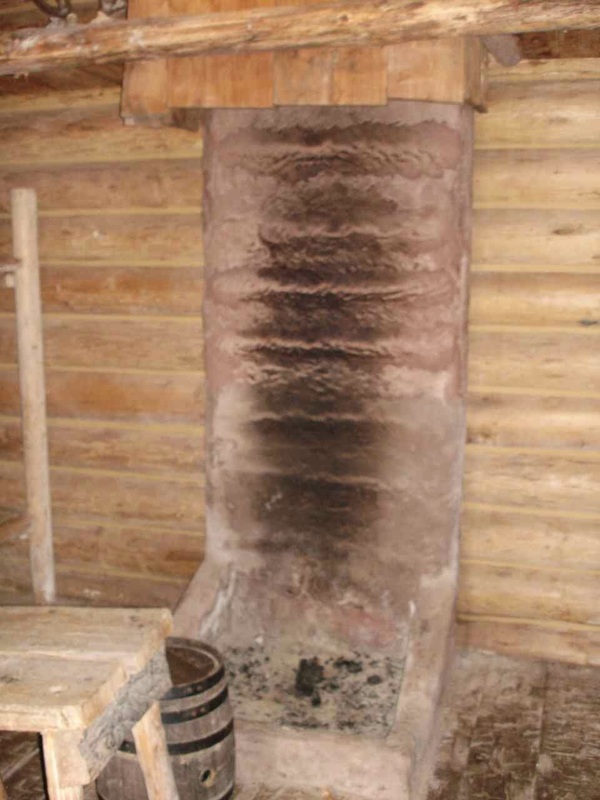 It is an open fire and note that the chimney above is made of wood. The Captains Lewis and Clark had nicer fireplaces with a mantle. This picture may be hard to see, but Jan and I loved this door. 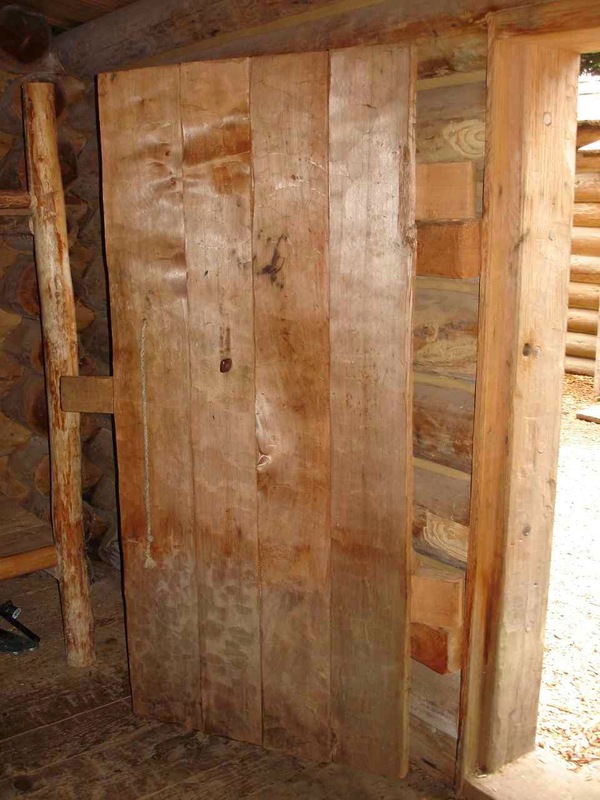 It is a solid, heavy wooden door with a substantial catch that would fit securely in a latch. What I really liked were the hinges. Note that they are also made of wood and dowels. Very substantial. 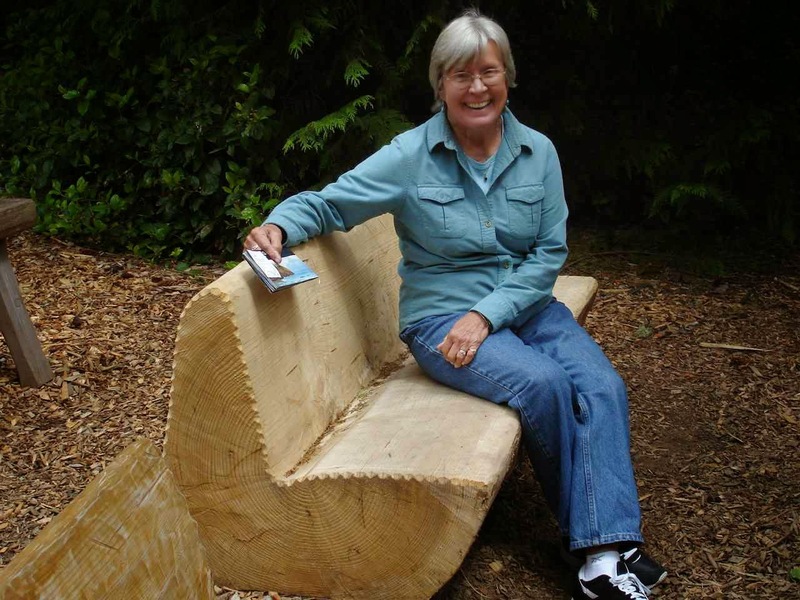 Jan sits comfortably on this bench at Clatsup made from one piece of wood. We are thinking it would be so easy to just cross the bridge to Washington. 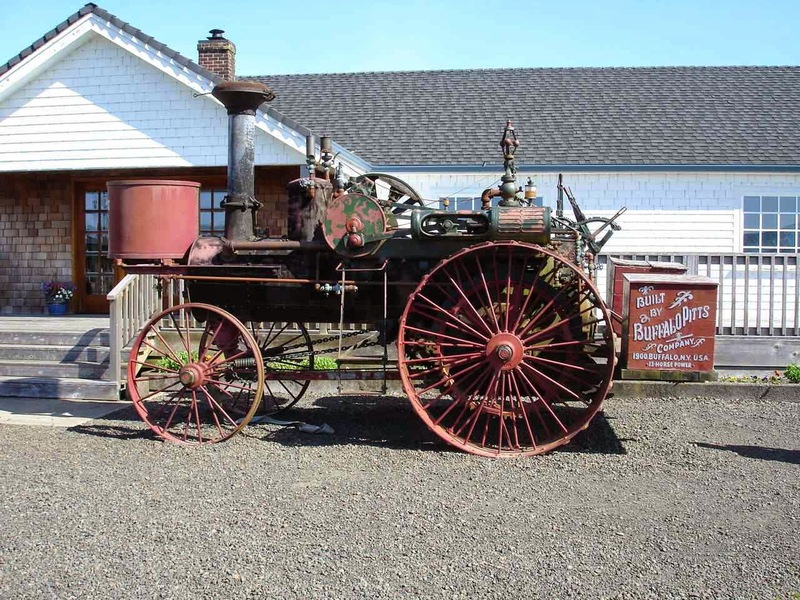 But, there is so much to see along the Columbia River Gorge, that we think we will head east and enjoy the scenery. By the way, at 46.16 latitude, we are now north of Livermore Falls, Maine (44.4) In case you were wondering, Somerset, Mass. is 41.7. We are glad we stayed on the CA coast. Will be in OR in a couple days. You will love the Columbia River Gorge. The only downside is the proximity to the interstate and railroad tracks. The noise sort of spoils some of the beauty.